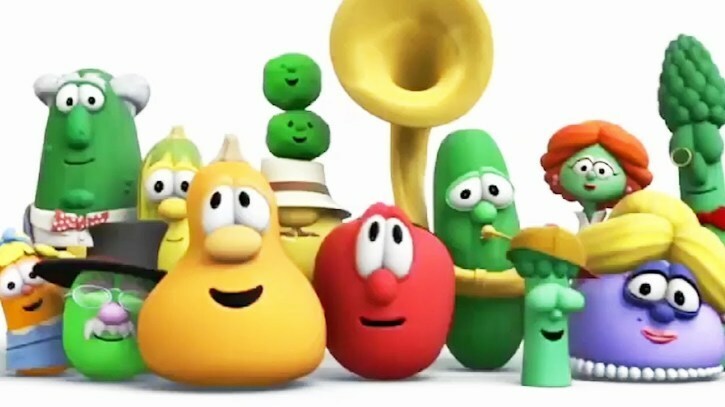 VeggieTales is an American series of children’s computer animated television shows, videos, and feature films featuring anthropomorphic fruits and vegetables in stories conveying moral themes based on Christian culture. The show is aimed at children aged three to eight. The episodes frequently retell and re-create Bible stories anachronistically reframed and include humorous references to pop culture. Yet according to The College Fix, the cartoons were labeled as “racist” in a recently held forum at Cal State San Marcos. Even the basic principle of this “presentation” and “study” are deeply flawed. As previously stated, Veggie Tales taught kids Christian themes and principles based on the Bible. That would be the Bible that teaches that Satan is the root and cause of evil. Someone is going to have to explain how anthropomorphizing vegetables shows a racial bias in anything. Where is the “whiteness in that? All of the characters were drawn in their natural colors – with no ethnicity present. Furthermore, we haven’t seen any statement in the Bible that talks about “whiteness” which leads us to believe that the student who created this project in a upper level class had never read the Bible or watched the Veggie Tales series. Eric Metaxas, a best-selling author and former “VeggieTales” writer and narrator, gave his take on the forum. Apparently the idea that this person’s “project” was lacking in any facts or accurate analysis didn’t matter to the professor who organized the forum. Of course, the idea that a forum based on the evil of one race being evil and that forum by its very existence is not somehow racist itself is lost on the intellectually vapid people who cannot think in any critical manner. Such is the state of “higher” education in the United States today. Mic drop from Eric Metaxas! Can’t believe all the money parents are spending to mass produce indoctrinated idiots at universities. It’s a crying shame!